"Don't you think we should stop celebrating spawning?" Comedian Bill Maher has made a career out of pushing his political views to a comedic breaking point. Doing stand-up comedy during the early part of his career, Maher hit it big when he landed his own TV show on ABC called Politically Incorrect with Bill Maher. After a successful multi-year run, the ABC bigwigs tired of Maher's penchant for pushing the envelope and cancelled the show. Unfazed, Maher moved his show to HBO, changed the format, and retitled it Real Time with Bill Maher. This new incarnation of the show is a no-holds-barred version of the previous one, and a much more entertaining, funny, and informative one as well. Republicans are sure to disagree with most of Bill Maher's views, but his comedy is undeniable regardless of your political affiliation. I don't agree with half of his views but I can't help falling over in laughter during most of his bits. 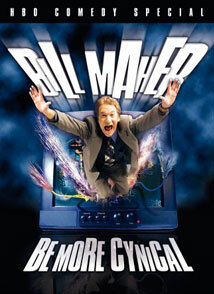 Those funny bits are fired off a mile a minute in the HBO special Bill Maher: Be More Cynical. This special originally aired in 2000 and captures a standup performance filmed live in San Francisco. It's unfortunate that it took Be More Cynical so long to become available on DVD, but this is probably due to the timing involved with Real Time currently airing on HBO. Once again, Maher doesn't pull any punches with the topics he rips on, and he manages to squeeze a lot of stuff into a mere hour's worth of time. No one is safe—Maher isn't afraid to poke fun at anyone, from holy rollers to mothers who continue to have kids. My favorite aspect of Maher's humor is his willingness to rip on political figures regardless of their party line. He gets on Al Gore and Bill Clinton just as much if not more than he does George W. Bush and isn't afraid to call a Democrat a moron if they truly are one. Other subjects come up during the course of Be More Cynical, including a very funny segment on drugs where he says that Prozac can't go up against marijuana because it will flat out lose. His comments on how we base our drug policies on Gary Busey are priceless. That's only a taste of the laughs and thought-provoking discussions that come out of Bill Maher: Be More Cynical, as Maher fills up the hour with some of his best work yet. Image Transfer Review: This full-frame presentation is pretty much on par with the way the show appeared on HBO. Black and shadow levels are important given the lighting in the theater that Maher is performing in, and, fortunately, those are handled well. There isn't a wide variety of colors on display, but those that are here are well rendered. A bit of grain is present, but there aren't any major blemishes in the transfer. Audio Transfer Review: The Dolby Digital 2.0 track is solid, but not incredibly dynamic, which is fine for an entirely dialogue-drive hour of comedy. The surrounds house the audience's laughter, but that's all the work they have to do. Bill Maher's discussions and jokes are always crisp, clear, and easy to understand. Extras Review: There aren't any extras on this DVD at all. HBO Home Video finally brings Bill Maher: Be More Cynical to DVD in the form of a bare-bones disc that does feature solid audio and video presentations. A couple of extras would have been nice, though.